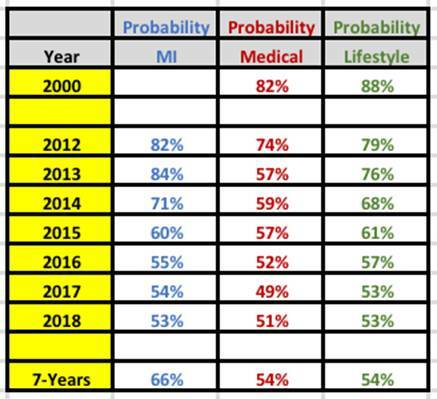 The author has extended his 8-year type 2 diabetes (T2D) research along with ~1.5 M collected data to examine the relationship among metabolism index (MI), general health status unit (GHSU), and the probability of having a heart attack or stroke. In 2014, he researched and built models for MI and GHSU, which is a 90-days moving average of MI, to understand and measure the multiple interactions between four metabolic disease outputs and six lifestyle inputs. He omitted genetic influences, personal habits, and past health conditions in order to focus on the dynamic changes of these 10 input and output categories with a total of ~500 elements. He utilized >1M data within the past 2,274 days to compute the probability of having a heart attack or stroke. He also conducted research work based on medical conditions output and lifestyle input separately. However, in this study, he performed an integrated input/output research. He used 80% of combined results to compare with other two results objectively. The mathematical simulation results are validated by past health examination reports. 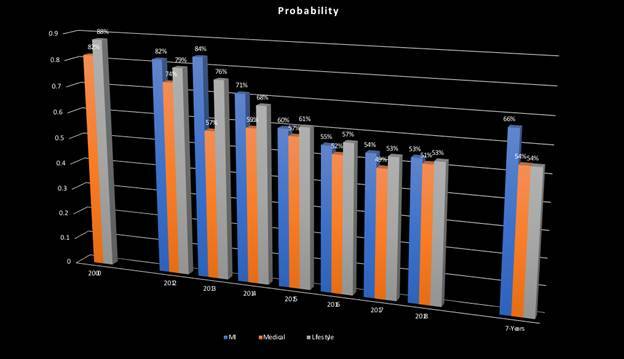 This big data numerical simulation approach using math-physics medicine will provide an early warning to patients with chronic disease of having a heart attack or stroke in the near future.